Valerie Gribben kept journals and wrote short stories from a young age. When she was in junior high and high school, she entered literary contests for the prize money (and won first prize or placed over a dozen times). Eventually, she wrote Fairytale, which was published when she was seventeen. The Emperor’s Realm and The Three Crowns completed her trilogy. This original Illustration by Eleanor Davis accompanied Gribben’s essay. TODAY, after four arduous years of examinations, graduating medical doctors will report to their residency programs. Armed with stethoscopes and scalpels, they’re preparing to lead the charge against disease in its ravaging, chimerical forms. They carry with them the classic tomes: Harrison’s Principles of Internal Medicine and Gray’s Anatomy. But I have an unlikely addition for their mental rucksacks: Grimm’s Fairy Tales. . . .
Fairy tales have always fascinated me: fishermen and talking flounder, siblings wending their way through a shadowy forest, seven brothers transformed into ravens. Although I always wanted to be a doctor and took the requisite courses to be admitted to medical school, in my undergraduate years I majored in English and studied Victorian fairy tales. Immersing myself in period documents, I saw tenuous connections between the worlds of fantasy and medicine, between fairy dust and consumption. . .
Fairy tales are, at their core, heightened portrayals of human nature, revealing, as the glare of injury and illness does, the underbelly of mankind. Both fairy tales and medical charts chronicle the bizarre, the unfair, the tragic. And the terrifying things that go bump in the night are what doctors treat at 3 a.m. in emergency rooms. . . . 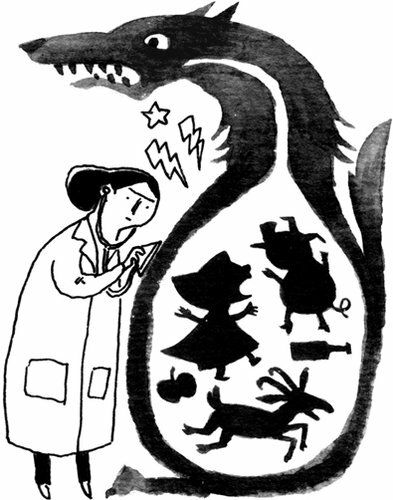 When “ER” Met “Hansel and Gretel” are letters to the editor in response to Valerie Gribben’s article, “Practicing Medicine Can Be Grimm Work” (8 July 2011). One of my tech-savvy supervisors recently found a way to upload daily photos of a patient’s resolving cellulitis to the patient’s permanent medical chart so that his outpatient primary-care doctor could track the infection’s improvement. Electronic medical records already are becoming more patient-friendly, allowing patients to view their lab results and electronic notes. As smartphones increase in prevalence, we’ll need to foster more and better ways for patients to upload pertinent photos and videos as part of their medical history. With Friday’s release of “Harry Potter and The Deathly Hallows: Part 2,” the world turns the final page on a 14-year saga. Since the first book’s publication in 1997, an initially simple story has evolved into a multimedia marketing dragon, spawning everything from the standard lunchboxes and bed sheets to complex online games and academic reference tomes. 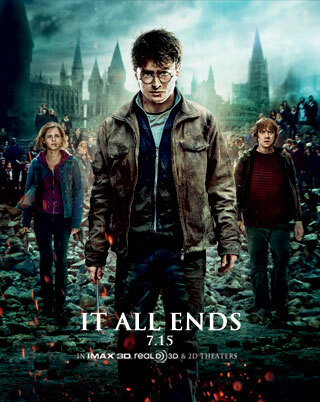 Though the book series concluded in 2007, it is with this last movie that the Harry Potter Generation — my generation — bids a true farewell to The Boy Who Lived. As the Harry Potter hysteria was just beginning, I read the first book over several afternoons in my local library and marveled at the fact that Harry and I were both 11 years old. In years to come, whether cramming for chemistry or preparing for the SAT, I always carved out time for the latest installment of Harry’s adventures. When Book Seven launched, I was studying abroad in Oxford, England, and I finished those poignant passages in the gardens and walkways that had stood in for Hogwarts onscreen.–Birmingham News (17 July 2011). 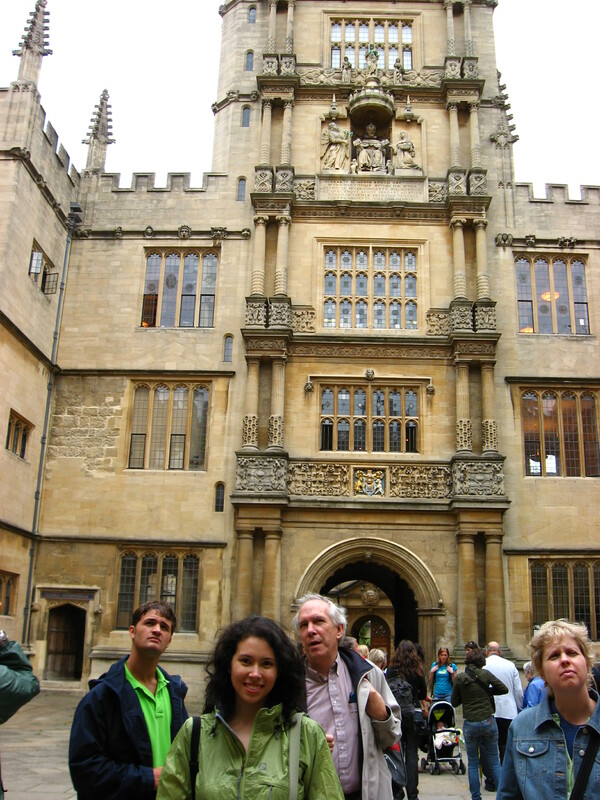 At “Hogwarts” with many other tourists.